I’ve been busy the last few weeks trying to get things a bit more organized and ready for starting school back up. Not having a dedicated school space wrecked havoc on us last year so this year I was determined to find a way around it. 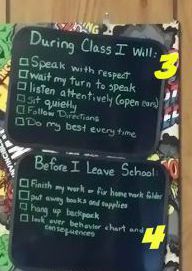 One of the “new” things I added to our school this year is a set of classroom procedures or expectations. Out of my three kids, my youngest has the hardest time with the school at home mentality. He really has a hard time separating his times out. Last year was melt down hell and I wasn’t much better I will admit. 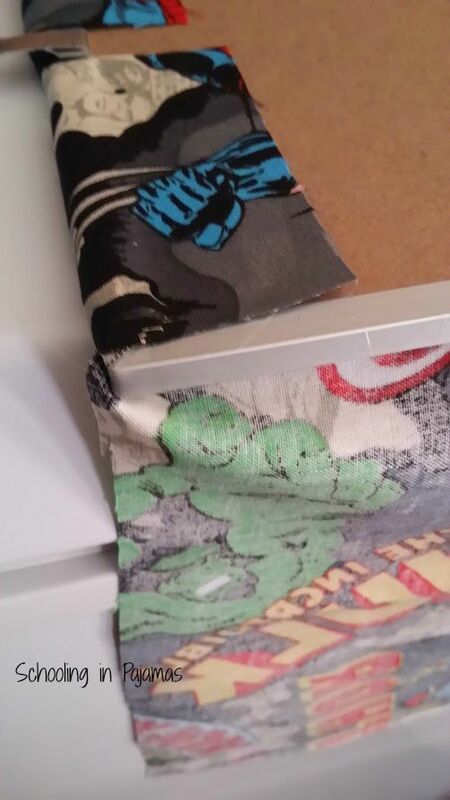 I took an old white board calendar that I could no longer get to come clean and covered it with superhero fabric I had still sitting in the closet waiting for a project to get done from last year. Turn the fabric right side down then turn the white board right side down onto the back of the fabric. Follow this step by cutting the fabric from around the hangers and edges so you can fold them flat to glue down. I used a low temp glue gun to glue the fabric down on the back side of the white board. It packs a punch for a small area. Which is what I was going for. Here is the finished project with all the stuff hanging on it. I’ll detail all the items in a sec but the fabric just pops in the background. So I’m gonna break down the items on the board just a bit for ya here. But first let me post the above pic again with numbers to help with identification because ya know PicMonkey is so fun to play with. (Check it out here: http://www.picmonkey.com/). I mean look at these super cool Comic Heroes themed numbers. Let’s start with supplies. My budget this year is pretty non-existent but I still had to give it a go. While I am still getting over the whole college tuition sticker shock (after some awesome scholarships and aid packages), I still feel the need to do something special for the kiddos schooling at home. So I headed to the Dollar Tree to see what I could find. I bought six mini black erasable boards with neon markers (only 4 used here) , a magnetic hang-able pocket, a six-pack magnetic black clips, and a package of reward bookmarks. 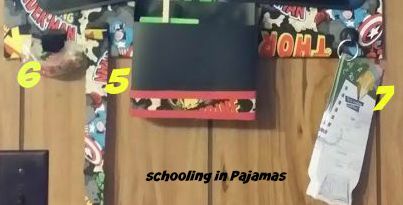 I already had on hand a package of mini colored wood clothes hangers (like you get from Hobby Lobby for crafts), glue gun with glue sticks, ribbon & felt strips (from my scrapbooking), and some extra magnet strips (also from my crafts supplies). Oh, don’t forget the stuff to hang the board from. I choose to go for nails this time and not the removable stuff from 3M. 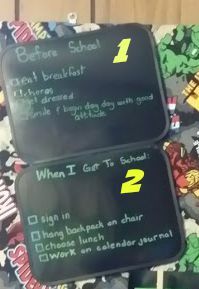 This board lets D know what he needs to do before we start school. At 8 and being in third grade, these should be no brainers for most kids. But what I’ve found for him is laying it all out is the best. No more of the “I didn’t know” or “You didn’t tell me” even if things haven’t changed. Just no excuses. If things aren’t done then he knows the consequences and that is that. More on that coming up. 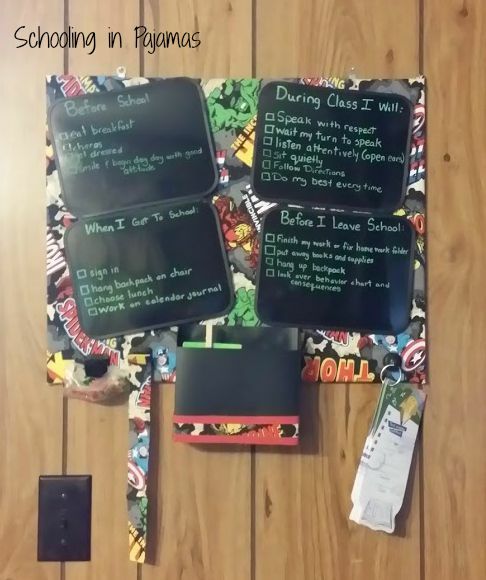 The list for this boards says: eat breakfast, chores, get dressed, smile, and start your day with a good attitude. Yes, I had to put get dressed because we have a habit of staying in our pajamas all day. Not a bad thing but not a habit I want to keep up either. This board again lays out the expectations. This first week of school is a bit slow since I am still helping him get into the habit and explaining how things work. Next week though he will be expected to go through this list on his own. 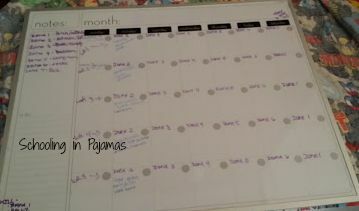 The list for this board includes: hang backpack on chair, sign in, choose lunch, and work on calendar journal. I will address each of these a bit later. Being a Charlotte Mason homeschool, I really thought about putting up the “I can, I ought” quote up. I love the quote but really, it would be lost on him. So I decided to go with what we had the most trouble with last year. I really did not want to spend this year in the same throes of defeat, failure, and anger that ran rampant between the two of us last year. The list includes: speak with respect, wait my turn to speak, listen attentively (open ears), sit quietly, follow directions, and do my best every time. 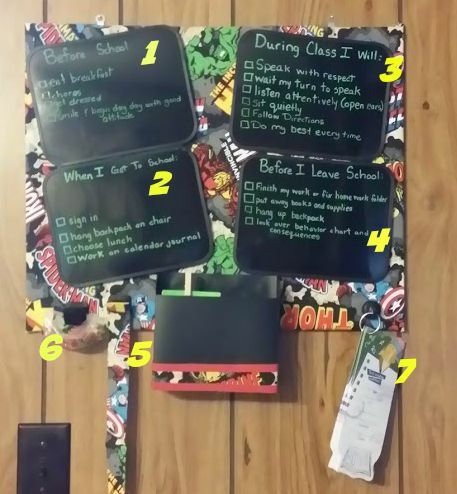 This board lays out what he needs to do before he can “leave” school for the day. I want him to take a more active role in being responsible. I also want him to know that misbehavior in school will have consequences that will impact the rest of his day. This list includes: finish my work or fix my homework folder, put away books and supplies, hang up backpack, and look over behavior chart and consequences. Next up on the board is the section for behavior. I got this idea from something I saw on Pinterest. It is loosely based on something a teacher used in her classroom but I adapted for our use. D used to love doing school even before he was old enough to do school. When we moved into our current living situation things began to change due to living with a relative (dear ol’ grandma – my mother) who just does not understand our school philosophy & tends to disregard our general parenting philosophy too. It’s a battle and as D gets older, he has picked up on it and has become disrespectful & whiny during school. So I wanted to give this a shot. The black box is a magnetic and holds four small index cards- green, yellow, red, and orange. Each card has a corresponding colored mini wood clothes pins hot glued to it. The front of each card is label with what it represents such as responsibility, behavior, super hero, and the orange is blank for now. On the back is listed examples of actions that fall under those categories. Responsibility has actions such as not being prepared, not doing job or chore, and not cleaning up. Behavior has disrespect such as back talk or interrupting, whining, raising voice, stomping feet, and arguing. 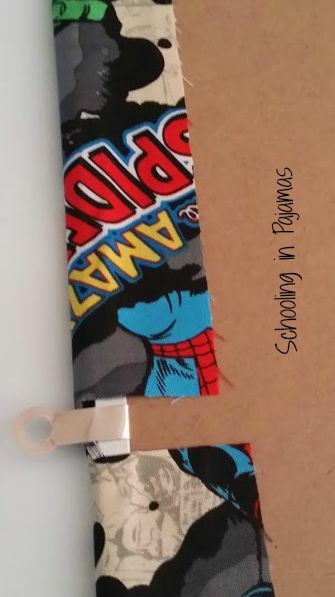 Super hero has no clips, using “super hero” manners or behavior without being asked or prompted, going above & beyond normal manners.The green does not wipe out any of the other colors but will simply get a “super hero” bookmark (labeled #7) to be used at a later time for something. I have left the orange blank to use for behaviors I see down the road or want to work on. The Fabric strip that is hanging next to the magnetic box is for the mini clothes pins to be pinned on. Once a clip is needed, one will be gotten from the bag (labeled #6) then clipped to the fabric strip. This keeps it in plain view so that his behavior is easily seen. He will know exactly how he has been behaving and what consequences he is going to be having. It also lets me know so that I can keep an eye on things. Maybe we need a break, time for school to end a bit early, or something. It’s easy to get caught in the trap of having to get things done and checked off our list. 1.How do I know when to give a clip? I have a foam counter that I keep on the table with us. One side is yellow and the other side is red. We start off on yellow. If needed, I give one verbal warning. When this does not work, I simply turn the counter over to red. This tells him that I am not going to warm him again and then next time he will simply get a clip. The third time I simply get up and place the appropriate color clip on the fabric strip. The counter is turned back to yellow. 2.What if he is getting several back to back? If he is getting 2 or 3 clips back to back over a several minutes or a lesson, I will simply stop what we are doing and set our timer for 2-5 minutes depending on the time I think is needed. He is allowed to get something from the quiet down/time out tub and sit at the table for that time. Then we resume the lesson. If we go over our scheduled school time by that amount of time then so be it. It helps for him to realize that his behavior has consequences. It takes from his later activities and his behavior will not get him out of doing school so he can go play. Does the counter really work? We’ve only been in school for two days but so far yes it has. I have not had to turn it over yet. I simply tap it and that seems to do it. I know it won’t be that easy all the time especially when the novelty wears off but for now yes it works. This morning he started to whine and I pointed to the counter and explained why the whining would get the counter turned over and a clip added. This seemed so that may be the way to go also this week then begin the clips next week to reinforce what are working on this week. What are the consequences of the clips? Each clip means he has to wait 30 minutes from the time school ends before he can play on anything electronic. Our stance on electronics flew out the window with our move, referenced above, so I battle where I can. Each clip is a thirty minute wait time. So if he has 2 clips then no electronics of any kind for one hour. If he gets 4 clips then no electronics for the day no matter what. It is a privilege and therefore getting clips during school time carries over into his personal time. Talk about motivation. Coming up next —– Super Heroes Go to School Part 2: What’s In the Back Pack!